I was o.k with that. It was, after all, the day after Thanksgiving and the store wasn’t violating any of my sensibilities. On Wednesday, it had been decorated for Thanksgiving,which also didn’t violate my sensibilities. Decorating for Christmas before Thanksgiving always violates my sensibilities. I have issues with the Christmas season beginning too early. I always have. I’ll never forget helping my mother at a Christmas Bazaar when I was still in grade school. I don’t remember the year, but I remember the date: December 5. I was absolutely convinced that was way too early to be celebrating Christmas. My rationale was that my parents didn’t even get a tree until Christmas was less than two weeks away. In hindsight, I probably thought that Christmas Eve was twice as long as any other day, and I certainly didn’t want to extend the waiting period any longer than was absolutely necessary. As an adult, I now think the month of December flies by way too quickly, and I would do everything possible to slow it down. I also know that the reason Advent is so special is because it is short-lived. 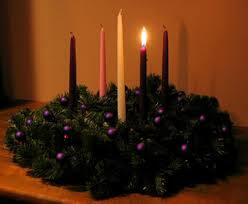 The reminder to savor every minute is one of the many reasons why the first day of Advent always makes me smile. Posted on December 1, 2013, in Family, My life, perspective and tagged 365 reasons to smile, Advent, Christmas, musings, smiles, Thoughts. Bookmark the permalink. 44 Comments. In our neck of the woods some stores were decked out for Christmas several weeks before Halloween… no that is scary!